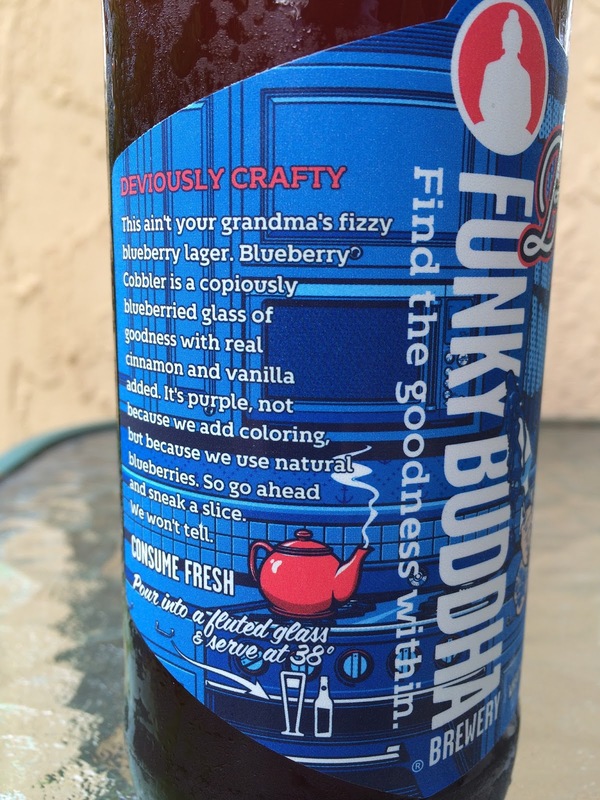 Funky Buddha recently bottled a batch of their Blueberry Cobbler Ale. I grabbed a 4-pack from the local store with extremely high hopes from our "Golden Child" brewery here in South Florida. I love the label! A young woman just finished baking her blueberry cobbler but has this evil grin and eyebrows that spell trouble. She's holding a pie server covered with blueberry juice while even the ice cream on top seems to be crying for help. The story to the side explains the situation a little. 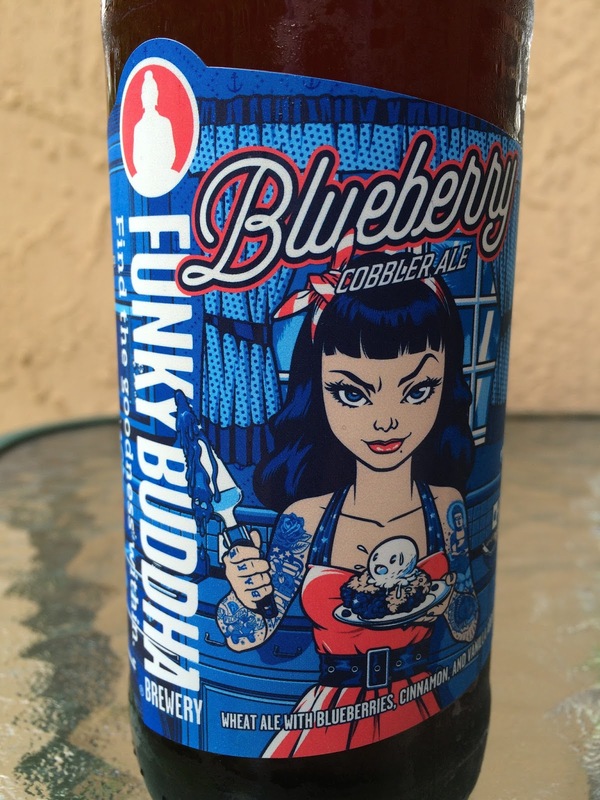 "This ain't your grandma's fizzy blueberry lager." 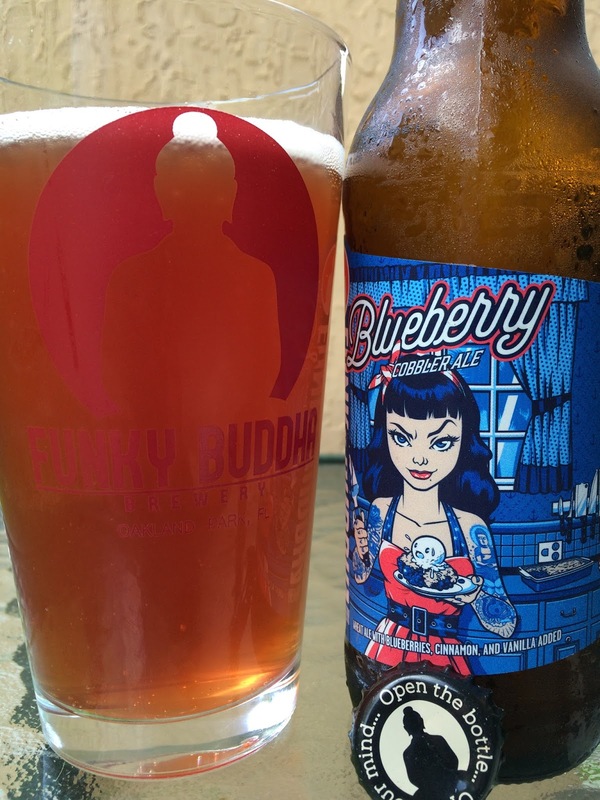 Instead, the brewery took a dig and made a "Deviously Crafty" wheat ale made with blueberries, cinnamon and vanilla. Consume Fresh. Pour into fluted glass and serve at 38°F. 5.4% alcohol. "Find the goodness within." Bottled On 06/30/15. Reddish purple in color. Sweet baked pie crust aroma with berry and cinnamon also contributing. Lots of blueberry flavors, lightly sweet and tart. Some wheaty texture and zing also appear at the beginning. Then the cinnamon and vanilla flavors come on strong, perhaps even too strong. The finish is a little more bitter and cleansing. Berry flavors linger. Interesting. Promised flavors are all there though the cinnamon and vanilla are a little overdone. Something about this beer was just a little weird, both flavor and texture-wise. Not bad but I'm certainly not in love. For now, I'll stick to baked Blueberry Cobbler. Saturday, I took the other three bottles from my 4-Pack to a friend's gathering. Five women wine drinkers, a Heineken drinker and a Fat Tire/Sierra Nevada PA drinker ALL LOVED this beer. So there you go. Don't bother listening to me. I'm used to it!